The Sherington Historical Society has put together a booklet about two events that happened in Sherington a few years ago and have perhaps slipped from living memory. This we called "Rum Doings in Sherington". The two stories in the booklet are an account of a murder that happened in 1872 and an exhumation from Sherington Churchyard in 1935. On the morning of Wednesday November 27th in 1872 at approximately quarter to eleven. "An outrageous and shocking murder" was committed on the turnpike road, leading from Sherington to Olney. It would appear that a casual farm labourer, named David Sharp, a native of Emberton, was sacked by his employerThomas Fountain, for poor work. He was also discharged the week previously "in consequent of the loose way in which he was doing his work". This made poor Mr. Sharp rather "dejected & desponding". On his way towards his home, he called in to Mr Fountain's stables and spoke, quite rationally, to Thomas Watts, about his being sacked. He left the stables carrying a basket and an unbroken hay fork. About half a mile along the road towards Olney, David Sharp met a 61 year old road man, James Boon, who at this time was employed scraping the road. It would appear that Sharp walked up behind James Boon and, without warning or speaking, gave him a "murderous blow on the back of his head" with his hay fork. In doing so he broke the tines from the fork. He also subjected his victim to kicks and blows, leaving him for dead. David Sharp then proceeded on his way towards Olney, assaulting others on the way. One poor old man Thomas Howsonwas so badly beaten that his life was despaired of, but he did recover. At the top of the hill, he threatened Mrs Mary Abrahams, who lived in the tollgate house, but she evaded him by running out of the back of the house. Sharp then proceeded to smash a window "all to pieces". Sharp then went on to Emberton. When he arrived in Emberton, he gave himself up to George Minard, the Parish Constable. George had heard of the window incident, but not of the murder, so he refused to take Sharp into custody for such a small offence. But he was suspicious so he followed Sharp towards Olney. Sharp then confessed to the assault of Howson & Boon. 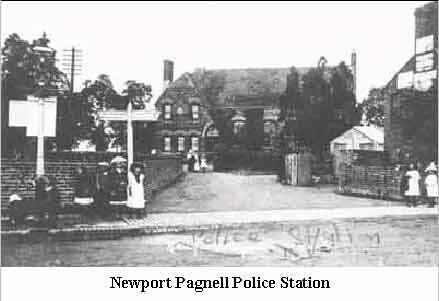 They were met on the way by police sergeant Batchelor, who then took Sharp into custody and on to Newport Pagnell police station. In the meanwhile a cart had been acquired and poor old Mr Boon had been conveyed to his home in Sherington. A surgeon had been summoned from Newport Pagnell, Doctor Rogers. He examined James Boon and found him dead, but warm. He died of extensive lacerations to the scalp and "A very severe fracture of the skull". On Saturday morning 23rd November 1872 a coroner's inquest was held in the White Hart. The jury of 13 upright Sherington citizens were duly sworn in and after hearing all of the evidence, found Sharp guilty of "wilful murder". He was then remanded to Newport Pagnell Petty Sessions on Wednesday 27th November, and from there to Aylesbury jail to be tried at the Bucks Lent Assizes. At Aylesbury, on Saturday March 15th, 1873, David Sharp was found guilty of manslaughter and sentenced to penal servitude for life. He could not be found guilty of Murder, because there was no malice aforethought and an insane person cannot legally be found guilty of a crime. which is available from the SHS Shop.